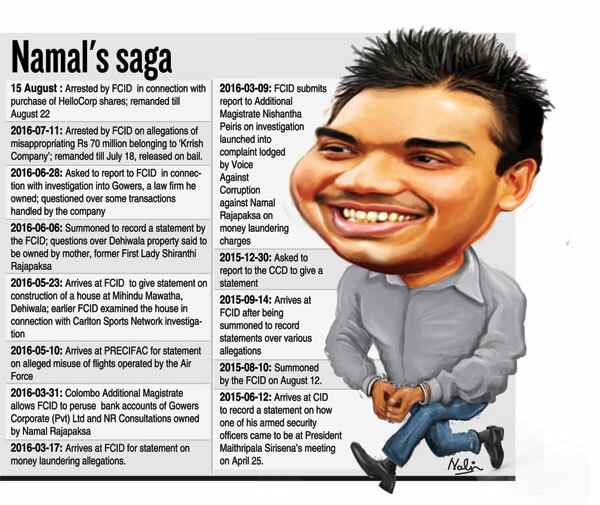 Namal Rajapaksa’s financial dealings during the tenure of his father’s presidency continue to be under scrutiny. He is once again in remand custody, charged with money laundering over the acquisition of a call centre by one of his many companies. 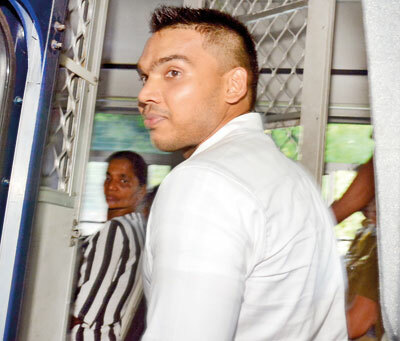 The Financial Crimes Investigation Division (FCID) has filed charges against 30-year-old Mr Rajapaksa, who was only released on bail on July 18 in a separate case. In that one, he is alleged to have misappropriated Rs. 70 million provided by Indian real estate company Krrish Lanka Pvt Ltd for the development of rugby in Sri Lanka. Several of Mr. Rajapaksa’s business associates are also in remand or, in line for arrest in the HelloCorp case. An international warrant has been issued for Ornella Iresha Silva of Nawinna in Maharagama, as she is currently at an undisclosed location abroad. She, along with Nithya Senani Samaranayake, who is now in remand, was a director of Gowers Corporate Services (GCS) (Pvt) Ltd, a Namal Rajapaksa company that acquired HelloCorp. HelloCorp, a business process outsourcing (BPO) company, was initially owned by Expolanka Holdings PLC. Among its portfolios was a lucrative contract with the national carrier, SriLankan Airlines. According to the 2012/13 Expolanka Annual Report, the Group disposed of its stake in HelloCorp for a consideration of Rs. 60 million. HelloCorp CEO Ravi Raveendran also divested of his 40% stake at the same time. A company statement said the shares were sold to the Senok Group of Companies, of which, businessman Noel Selvanayagam is President. The annual return of HelloCorp filed in October 2014, also names Christopher Noel Vishkaran Selvanayagam as a director of the company. It is also signed by Wanniarachchige Thiyumi Shamindra Fonseka Abeysinghe as another director. However, the name entered into the HelloCorp annual return form under “Existing Shareholders” is GCS (Pvt) Ltd. In 2013 — during the period the HelloCorp sale took place — the directors of GCS were Ornella Iresha Silva and Nithya Senani Samaranayake. They have placed their signatures throughout the form. But the sole shareholder of the company was Lakshman Namal Rajapaksa of Carlton, Mahawela Road, Tangalle. He is listed as holding 100% of the shares of GCS. In effect, therefore, Mr. Rajapaksa’s company held full control of HelloCorp according to mandatory declarations filed with the Registrar of Companies. The GCS annual return dated February 2013 also reveals that, before Mr Rajapaksa took over full ownership of the company, it was owned by NR Consultants (Pvt) Ltd — again of Carlton, Mahawela Road, Tangalle. NR Consultants also belonged to Mr.Rajapaksa and is another of his firms currently under investigation. Several directorship changes have taken place since these first documents were filed with the Registrar of Companies. Another GCS director Sudarshana Bandara Gagengoda was also remanded. Another suspect, Sujani Bogollagama, was reported to court as being unwell and warded in hospital. An international arrest warrant has also been issued for Indika Prabath Karunajeewa. Mr. Rajapaksa’s lawyer said he expects bail for his client when the case comes up at the Colombo Magistrate’s Court tomorrow. “All alleged offences in the ‘B’ report of the FCID are bailable in a Magistrate’s Court,” lawyer Premnath Dolawatte said. “There will be no need to go to the High Court.” He confirmed that charges had been filed under the Money Laundering Act and the Penal Code.